Jeffrey A. Nelson: What is the Labyrinth? Previously: What is the Examen?, What is Lectio Divina?, What is Fasting? The first thing that you should know is that the labyrinth is not a maze. It annoys me when people refer to it as such, so I wanted to mention that right away. Rather, a labyrinth is a single path with one entrance and one exit (which are the same), usually arranged in a circular pattern with the center designated as a place to stop, rest, pray, or reflect. Because of the way the path bends around itself in this traditional design, each layer of the path between the edge and the center is called a "circuit." The number of circuits helps the walker know how large and how long the labyrinth is. There are two common numbers of circuits in a labyrinth. The "classical" design has seven circuits and dates back to ancient Greece, where it originated as part of a myth to keep the Minotaur contained. 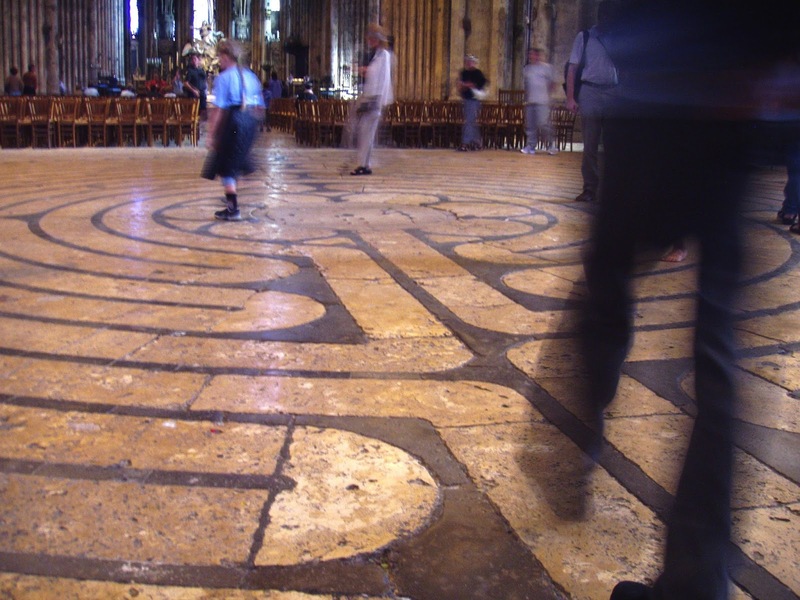 The other most well-known design is the 11-circuit labyrinth often called "Chartres-style," named after the Chartres Cathedral in France which helped popularize it. Today's labyrinth practice is a form of pilgrimage, a time of spiritual reflection where the walking itself is an act of prayer. As you walk toward the center, you are journeying with God as your guide. You may or may not experience any grand revelation; the meaning is in the walking. 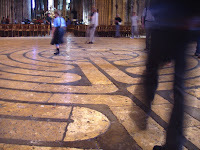 Here are a series of steps to observe when walking the labyrinth. 1. Stand at the entrance. Take several deep breaths in preparation for your walk. Say a brief opening prayer, asking God for guidance as you begin. If you come to the practice with a particular question or concern, include it in your prayer and then let it go, entrusting it to God as you walk. 2. Begin walking. Take your time; do not hurry toward the center or look too many steps beyond where you are. Focus on the walking, the movement. If you feel moved to pause, do so and let what inspired you run its course until you think it's time to continue. If others are walking at the same time, be mindful of them so that you may pass each other with minimal disruption. If a thought or insight comes to you while you walk, allow it to linger until it becomes a distraction, and then release it. 3. When you make it to the center, linger for as long as you like. Find a prayer posture that is comfortable for you, whether sitting or standing, arms raised or lowered. Much like as you were walking, remain with insights as long as necessary before letting them go. When you feel ready, begin your walk back out the way you came. 4. Much like your journey to the center, focus on the walking. Pause when moved to do so, be aware of fellow walkers. 5. When you reach the entrance, turn and face it. You may say a closing prayer of thanks or simply bow to acknowledge the conclusion of the exercise. It may be helpful to journal about the experience in order to process what happened. It may lead to further realizations about thoughts or feelings you had while doing it. In my experience, the labyrinth can be useful particularly when sitting still to pray is not an option due to restlessness or temperament. It is a form of movement prayer, embodying the journey of faith on which we are constantly traveling.